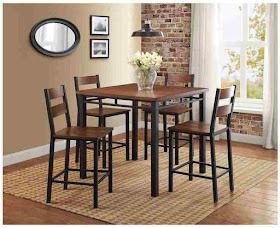 Better Homes and Gardens Mercer 5-Piece Counter Height Dining Set contains a square counter-height dining table and four similar chairs with strong metal table and chair frame. It accommodates up to four. There is adequate room for 4 people to gather without bumping one another. The table is a perfect wood color it's great for a smaller apartment. It's warm and looks great with most decors. The color combination of black and brown ensures it fits with most colors within your home. To clean the top, use damp sponge and when it dries, spray a little furniture polish and wipe clean. Use placemats to minimize scratches. How to set up Better Homes and Gardens Mercer 5 Piece Counter Height Dining Set? attach the bars together first, then attach it to the table. Be sure that you insert all of the screws BEFORE you tighten them up. When putting each piece together just barely snug the screws tight then come back and tighten the screws all the way which helps with the assembly.